Chameleon Pet Care - What To Do? When you see most chameleons for sale, they are juveniles who are smaller than they will be at full adult age. On average, adult pet chameleon can grow between 12 to 18 inches as adults. They can live five years or more if they are cared for properly. Because of the behavior and size of the lizard, the tank must be at least 30 to 40 gallons in size and can only be used to house a single chameleon. Among interesting chameleon pet facts are their unique feeding habits. While they primarily live off of insects, they also need vegetables, too. You will need to provide live prey, such as crickets and mealworms, daily or every other day depending on the age of your lizard. Leaves, collard greens, and some types of lettuce should also be given periodically. Part of a healthy panther chameleon diet includes gut-loaded insects coated in calcium supplement so make sure to get the insects ahead of time so they can be prepared appropriately. You need to provide lots of plants and areas for climbing. 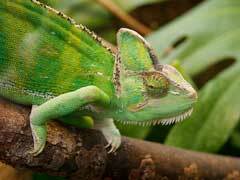 Chameleons won’t spend a lot of time on the ground because they are mainly tree dwellers. You’ll need to keep the tank heated so that the hotter side of the tank is about 90 degrees Fahrenheit and the cooler side is about twenty degrees cooler. UV light running for up to 12 hours a day is also needed and you’ll need some type of drip system for water since your chameleon will not drink out of a bowl. Chameleon pet prices vary depending on where you find your pet and on which breed you choose. Expect to pay around $75 just for the chameleon. Accessories and housing required for good chameleon pet care will cost another couple of hundred dollars.